Such a long list of con's. All valid of course. And no award. Does that mean it got tarred and feathered instead? Really? I'm actually mystified by the list of cons. It's like I must have the only example of the camera that focuses quickly in low light, is comfortable and light in hand. Crazy stuff. That's sample variation for you. "It's like I must have the only example of the camera that focuses quickly in low light"
Maybe your standard of focusing speed is a bit different from DPR standard. Many people claim that mirrorless focusing is too slow, but I found it sufficient enough. I own a D800E and a D600 as well, so I suspect I know when a camera focuses quickly in low light. mike, all I can say is that mines been great in low light, but then I had no issue with the last D600 I received either (an earlier one I owned had a defective AF module which is what I suspect happened to the review unit here). Can't argue with the focus point array but Thom had a very honest assessment of that in his review. I didn't understand the +- point, do you mean the buttons on the side of the screen? This is for Nikon. So, you expect us to buy this camera and still carry around our camcorder for videos. We know you market this camera as a "Pure Photography" camera, but common, we can still use a camera that has a video function as "Pure Photography", and then switch that button for "Pure Videography" too. Really dumb marketing Nikon. Well on the bright side if Nikon makes too many Df's they can always tear them down and use the parts to build D610's instead. 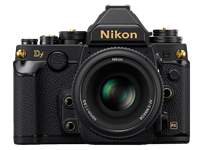 Joking aside, I think the basic concept and aesthetic behind the Df was a good one but Nikon just cut too many corners in terms of features and specifications in their quest to produce a high-margin product. Glaring omissions like interchangeable focus screens, aperture control in Live View, dual SD slots, higher-quality fit and finish, the clustered 39-AF point system from the D610, etc... all while charging $1400 more than what refurbished D600's are selling for is just too much a value stretch for this late stage of the camera industry. The market has matured to the point where companies must lower their prices and/or increase the value they provide if they are to rise above the noise and have a successful product. Companies like Pentax, Sony, and Olympus seem to understand this. Nikon went in the opposite direction with the Df. 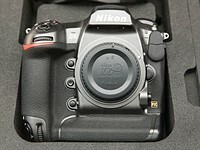 Sure looks like the screen can be changed by Nikon with the right tools, so like the D700. Nikon is not going to sell a body with the D4's sensor for less than the D610 retails for, while the D4 is still selling new, this is really obvious. This body has extraordinary fit and finish--clearly you're going by something you read and have not handled the body. Some how I'll bet this isn't hugely high profit margin for Nikon. That you've shot with it and liked it well enough doesn't then mean that when you say Nikon should only charge $1300 for it you'll be treated seriously. See the problem? You're asking Nikon to charge the price of a D7100 for a full framed body with the sensor from the D4? It's just not going to happen for at least 5 years. I think if Nikon would've spec'd the Df closer to a D800 then the $2,750 introduction price would have been better received. As the body stands now I think $2,249 is a reasonable price. In many ways the specs of the Df are better than the D800. And in fact it's that lowlight high ISO capacity that really draws a lot of attention to the Df. 2700 minus 1400 does NOT equal 2250; you're off by a big percentage and that's a problem. All I'm going to say is that this is a great camera that leaves a smile on your face every time you shoot with it. People can have any opinions they like, but the pattern I've noticed is that owners think it's great, non-owners perceive weaknesses. The camera feels great in hand (if anything it's light for a DSLR) and, in my opinion, the controls are well thought out for personal use. It's simply incorrect to say low light AF is poor - my model focused in virtually complete darkness! The camera is relatively light and it's a body to mount primes on. The 16mp sensor isn't a champ at Dynamic range at base ISO (although it is above base ISO) but it's got better noise performance than just about any other camera. Another nice point is that people react well to this camera. They look, they smile, they ask you about it. It's a very positive experience. Yes it lacks resolution, but in practice its a non issue. All in all, I think Nikon have a very hot camera on their hands here. It certainly didn't leave a smile on the reviewer's face. I wouldn't say it's negative. I cannot speak from experience, but what I get from the review is that the Df is slightly underwhelming on too many fronts, considering the big price tag. This is an overwhelming camera, and yes I've used the D4, D3s and D700. What does "fugly" have to do with function or performance or end image quality? Do you want the body to complement your neck tie, or do you want to shoot photos well? 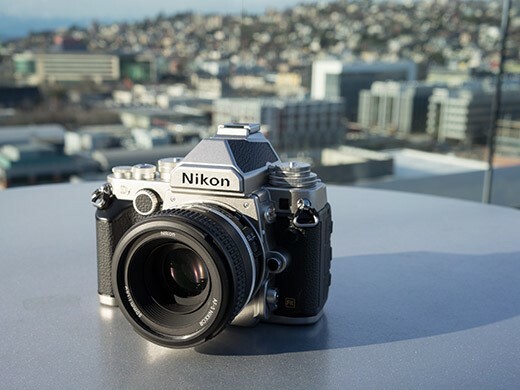 I don't agree with Pik2004, but the Df's appearance is definitely fair game for criticism, considering that Nikon adopted a radically different external design specifically to appeal to nostalgic users. You can't have your cake and eat it too. That's fine if you don't like the aesthetic of the body, but that has nothing to do with its function and image quality. And not buying it because it doesn't go with your tie, but still performs every function you need/want seems odd and not a position someone who's serious about taking photos with digital cameras would take. Would you buy the Df even if it were painted pink with green polka dots and yellow stripes, with Barney the Purple Dinosaur logos all over the place? I doubt many people would. You may think it's frivolous, but appearance matters. Whether Df meets your aesthetic standards or not is a different matter. You've described nothing aesthetically that black gaffer's tape can't fix. Also all that colour would be good camouflage, making people think it's a toy. Though yes, I'd expect a discount for the polka dotted version. This ''manual controls festival'' won't sell.Period.Maybe for 1200 less? Cameras in modern era are ELECTRONICS.lens less..yet,aesthetics have changed,no matter what SOME people think. $1200 less aint going to happen while the D4 is selling new, get it? Except, you know, when it does sell. X100 was pretty popular as I remember... everyone going gaga over the retro look and feel. The manual controls were much lauded. You don't hear people complaining that the M9 has a shutter speed dial on the top plate... and no autofocus!! But this is where Nikon got it wrong: this camera is designed to appeal to both the "match needle", Nikkor Auto crowd ... and the 3D matrix, tracking-AF crowd. With the predictable result of producing a cluttered, complicated, large and expensive camera. And then Nikon has to go and market it as the embodiment of "pure photography". Ouch! You mean Nikon produced an over priced under featured camera?.....say it isn't so!!! Except neither point is true. In other news good Leica and Zeiss lenses are worth those prices--including the new F/2.0 50mm Leica M.
"You quickly realize that you've got the shutter mechanism and AF of a D610 with a 50% 'retro tax' added. And while you may get the D4's high ISO image quality, you don't get its low-light autofocus or backlit controls, both of which contribute hugely to its shooting capability in poor light." I normally tend to criticize but this a super professional review. There are enough "cons" here to make me wonder if Nikon will make a spectacular DF-2 or if this is as far as they will go with pure photography. Personally, I think Nikon oversold it. Imagine if this unique design had come out of nowhere, with no teasing and no expectations. Yeah, what's up with that? Did I miss some clarification from DPreview on the lack of an award for the review, or is it just not showing due to some bug? Edit: sorry, I just read an explanation for the no award below. A solid balanced review. As an aside, what exactly do you people do to your cameras that have the doors falling off! they drive them really fast on dirt roads. It shouldn't have had Live View if Video wasn't an option and if it doesn't have a built-in flash why should it have infared remote? As far as image quality goes, nothing from anywhere else matches it at higher ISOs. Even if you downsize D610 or D800 images, they are still noticeably noisier. For low-light, with lens suited to the subject so no real cropping is needed, it's unbeatable. The battery door on mine has never fallen off and the silver has the same tone all over without any variations under all kinds of lighting. DPR you must have used a pre-production model and not the final production model. We used a full production camera. I still don't understand why you say that the silver has different finishes and tones. I have yet to notice this under all types of lighting (sunlight, tungsten, etc), and believe me I have searched for this many times after reading this comment from you in your preview. The battery door has been like this on many nikon dslr's for a while. its nothing new and its not going to just fall off. If we hadn't seen people experiencing the same thing on the forums (suggesting it's not just the one we've tested), we probably wouldn't have mentioned it. However, since there's no battery grip available, it's odd to have a door that on some examples, at least, falls off. With regards materials and finish - the BKT button on the side of this one is a very different silver tone (it looks like plastic) from the body panels. The front plate of the camera around the lens mount feels more like plastic than the mag-alloy top and bottom of the camera. The transition between a rubber grip on the back and faux-leather on the front just doesn't give off the sense of quality that I'd expect from a camera costing that much money. It's about more than just the tone of silver. As far as I can tell the front plate around the lens mount is made of plastic on both the silver and black versions. I have checked this very carefully. For the price, this front plate should have been made of magnesium like the rest of the camera. As for the buttons on the front like the BKT button, they seem to be chromed with a finish which differs from the top, under and front plate. I have no problems with this, mainly because the buttons on the front are all chromed the same. This is all a matter of taste of course. As for the silver tone on the body, it's the same all over including the front plate. DPR, you forgot to mention "NO VIDEO" as a con. I was looking forward to purchase this camera, then found there is no video function. It would have been a perfect camera for me. Oh well, will save my money for something else. I don´t see "no vid" as a con in a camera made for photographing. With these days and age...YES. It is almost consider a cripple camera without video. For people like me to love take pictures and record videos of family and friends. Not to mention wedding photographers who records clips of the couple walking down the aisle. Someone that enjoys photography and has a family may want a camera with video. Lack of video, or mediocre quality thereof has been listed as a con for many cameras, if memory serves right. So I'd agree it's odd it's not listed here. "I don´t see "no vid" as a con in a camera made for photographing." I remember DPR wrote "No dedicated movie button" under the 'cons' list in the Pentax K-5 review. So sometimes video matters even for a camera made for photography. You would think the rating would be more dependent on the value. That's really what it comes down to for most buyers anyways. The best bang for your buck. This camera certainly isn't it. Not when you can get a Sony a7 for a thousand less. I don't think the Df was ever about value. Look at the comments of people studying the "silver" finish to see if the color varies in different light. The doors falling of a $2700 body! Nikon, what has happened to you? That said, it still "looks" good. It's never fallen off mine. I have a very wide tolerance for camera appearance (K-01, V1, even Sony a7 to a point), but the aesthetics of the Df make me wince to look at it. It's just .. I dunno .. at some basic level it doesn't work. The proportions are unbalanced? It's too big? It's trying too hard to look small? Unhappy marriage of analog and digital design elements? I think that its just TOO MUCH CAMERA. So many controls and buttons, add-ons and angles that there are no design lines of an actual camera left to look at. The EM-1 suffers a little in the same way, but being smaller and crucially much thinner in stature its visually not so off-putting. The FM never looked that cluttered. When you start to run out of innovation, you start digging the closets and attics that remind you of how great you were in the past. Yes, drape over that mediocre digital contraption with the beauty of a begone era. Keep those Jurassic Models coming in, folks! Basically its not for you. You could have simply said that, but instead you took the not-so-scenic route. Actually, I Nikon makes digital FM2, that might become something. Not just mimics some of FM2 features but sized like FM2, with FM2 ergonomic. But digital. It has a simple 4-bar battery indicator on the shoulder LCD, it just doesn't let you check the % charge or number of times that battery has been charged (as the D610 does, for instance). @aarif - focusing is highly lens dependent but I've not had much luck getting the camera to focus in even moderately low light (especially with the 50mm F1.8). If shot in all-points, 3D mode it's better but when trying to focus somewhere specific, it sounds like we've had a very different experience from you. Richard, do you monitor the forums? There have been no complaints about the AF, mostly praise, or at worse a wash with the D600. Nor in any other reviews I have seen. In fact i think the only post with quality issues was 2 people about the battery door. 16000 iso looks fantastic with that old 105mm F2.5 in the portrait shot in the samples gallery. Wow, that was probably the harshest review I've ever read at on this website. "Part of this is down to pixel count (this is a pixel-level test, which gives low-pixel-count cameras an advantage) but the Df's sensor does exceptionally well at high ISOs. Take a look at our test scene if you want to see a normalized result, which gives a clearer comparison of how these cameras, with their different pixel counts, compare when looking at the image as a whole." Score of 81 seems high for the number and type of "cons." It's OK in case of Canons and Nikons. It's only other inferior brands which must suffer for their faults. This comment is so subjective, I'm not sure what it contributes to the conversation. Back before digicams, people didn't pay that much attention to the looks of a camera (except for the TLR vs. SLR vs. RF folks), just to what they could accomplish with it. How long have most of the non canonikon users been waiting for reviews. 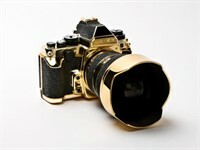 The Df has generated more interest than any other camera this year. Also, we didn't prioritise it ahead of the Panasonic GM1, nor the Sony A7 and A7R, which are proving to be more complex, so their reviews are taking longer. But other than trying to respond to reader interest and not putting it ahead of other 'non Canikon' cameras, your point stands. The Df is a fascinating concept, I agree. In fact I wish Pentax had thought of it. Can you imagine a FF LX? It was an excellent review BTW. It's not elegant like the retro cameras we remember fondly. Take a look at a Pentax K1000, Minolta X-11 or XE-7, Contax 139, Nikkormat FTN, etc. Far too many bells, whistles, knows, buttons, etc. Can't anyone simplify the DSLR experience. That would be welcome. If there was anyone to do that in a pleasing retro fashion, it would probably be Leica. Technically, an S2 is a dSLR, albeit a medium format one. Nothing is simpler than the Canon SLR main wheel. You just program what you want into each notch of that main wheel and that's it. Having to change every control when you need to takes forever. If you switch between tripod and handheld stuff frequently, then you go through everything. Its too difficult. It depends on your shooting style, but I think canon pretty much got it right. Maybe adding more notches to that wheel would improve it. Having everything broken out into its own knob makes it harder it seems. Some people may like it though. I never liked Canon operation for some reason. My favorite features are settings on older series nikons (N90s, button plus a knob turn) and the 'hyper' mode on Pentax. Takes me back in time.. fond memories there. That was a smooth operator..
Not even a silver award. I hope the dpreview staff are prepared for some Nikon fanboy rage. I would pull the triiger for Pentax K-3 Silver body and lots of silver HD coated lenses ! I came to the conclusion that lenses are for us, what jewelry is for our wives. That being said it's good to have someone making sure your LBA doesn't get off hand. the conclusion and summary of this camera isn't particularly good. its not bad, its a good camera, but many people will form their own judgement based on cost and functionality. Nevertheless it gets 81%. I really don't understand that, simply that dpreview are completely inconsistent with their summaries and their scores. The scoring is based heavily on image quality - something the Df is really good at. sorry, but this isn't obvious to me. If I understand correctly, the scoring is an objective measure of the various qualities, and awards are based on the editors feeling about the camera, the price/performance ratio and other less tangible measures? @completelyrandomstuff - that's exactly right. The scoring is as objective as possible and is weighted towards image quality. The award (or lack of it, in this case), is the overall summary from the reviewer's perspective. @harold1968 - that's not a bad idea. "better" for what? Slow buffer? And lower IQ at high ISOs? ISO-100, ISO25600... well, that escalated quickly. No, the review's wrong. It's fine to focus in low light. Differing definitions of low light, perhaps. In casual use it was hunting quite a bit in a dimly lit bar setting. Once it did establish a focus lock the pictures were great.